Kids will love ordering the events in this spring sequencing cards printable. 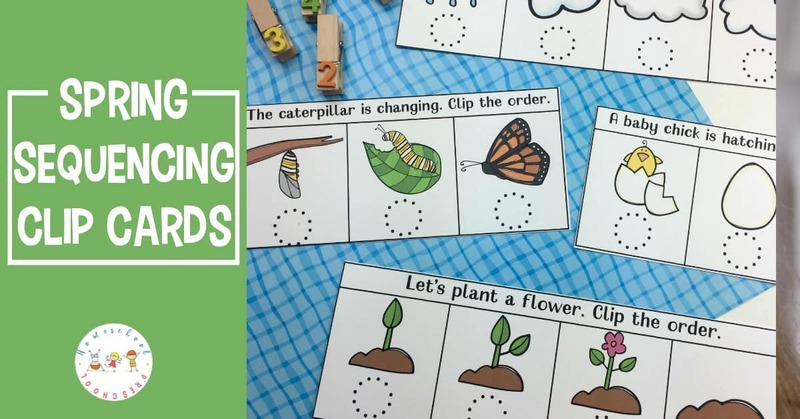 This is a great way to introduce preschoolers to sequencing! This set of free preschool printables is so much fun. 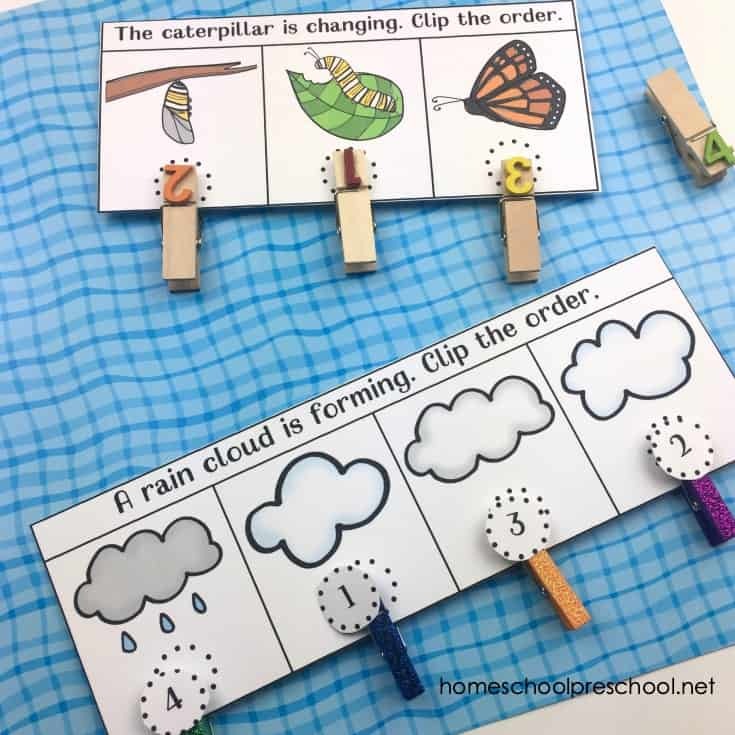 Kids will build fine motor skills as they work with clothespins or counters to put these spring events in the correct order. There’s also an element of logic involved in learning to identify what comes next as kids talk through events. My sequencing cards are super popular on the blog. From daily life skills to story sequencing and lots of other options, there is plenty available to keep your little ones engaged. 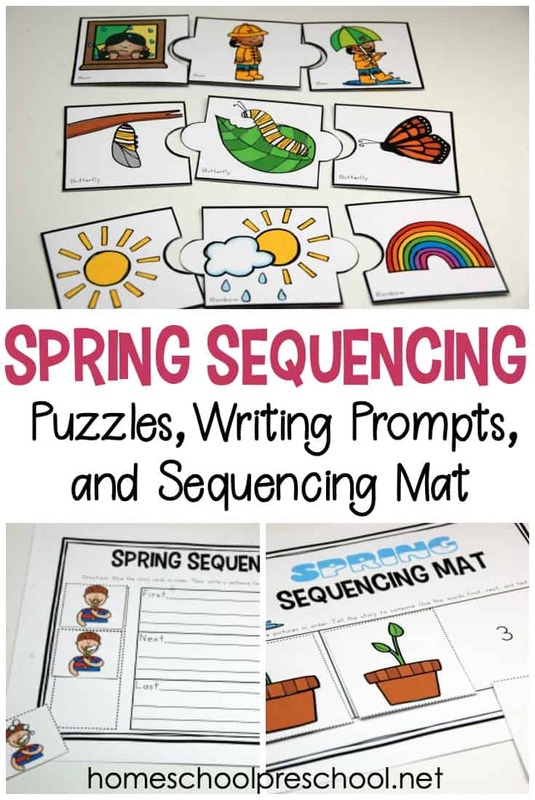 This sequencing cards printable is perfect for spring! 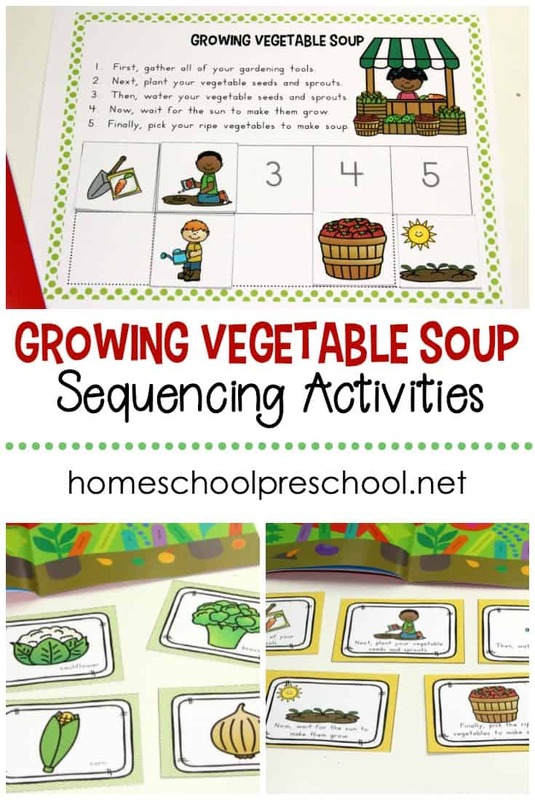 There are three-part and four-part sequencing activities. Each activity featured is something that correlates with spring – butterflies, rain clouds, life cycle of a plant, etc. 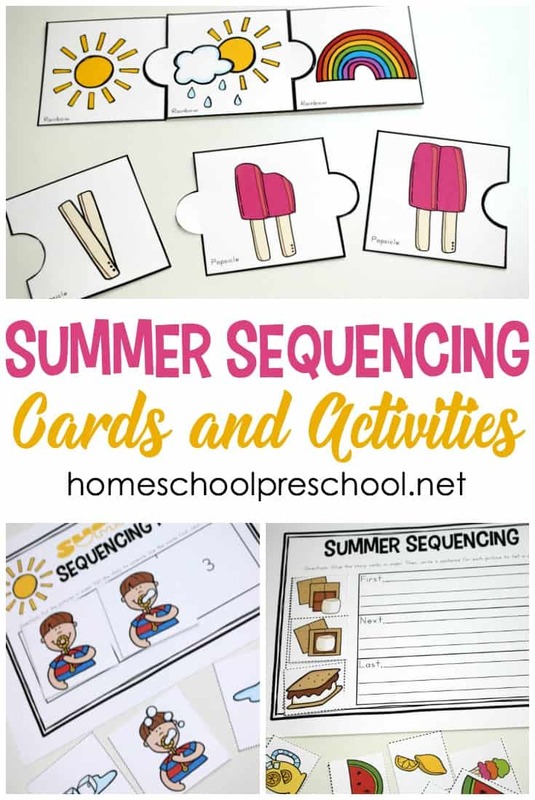 All you’ll need to do to prepare these free printable sequencing cards is print, laminate, and cut. I suggest printing the pages on cardstock as its more durable than standard printer paper. Laminating the sequencing cards makes them sturdier, as well. It will also give you something besides the paper to stick velcro dots to if you choose to use those. I’ll explain more below. Cut each of the sequencing strips apart leaving them in one whole strip. So, you’ll have two strips per page. Choose a strip to work on with your preschooler. Talk about the event that’s featured in the pictures. See if they can tell you the correct order of events orally. Then, let them identify the correct order of the images. There are a few ways they can do this. One is to use numbered clothespins. I found a set at Target a few years ago. Another is to use the numbered discs that are included in the set. You can glue them to clothespins, or attach them with velcro dots. 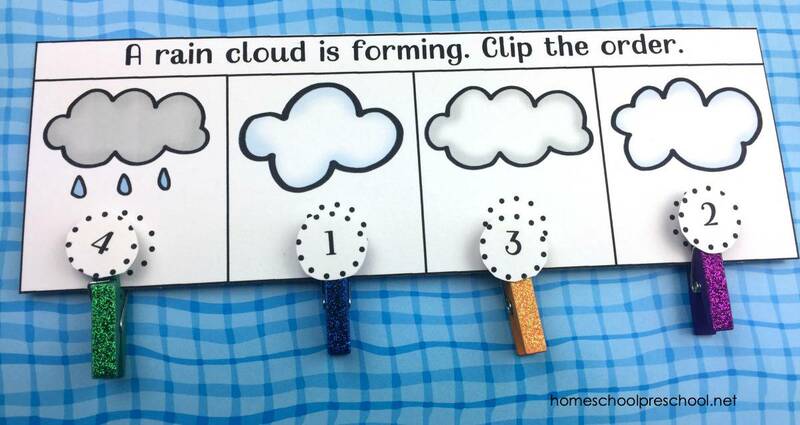 If you enjoy a good spring rain, you’ll love these rain crafts and activities. They’re perfect for keeping tots and preschoolers busy on a rainy afternoon! Learning to sequence is an important skill for kids to have. It helps them comprehend what they hear and what they read. It also helps them develop their problem solving skills which will help them in many subjects during their academic years. Starting out with fun activities like this get them used to putting events in order and helps them understand what comes next. 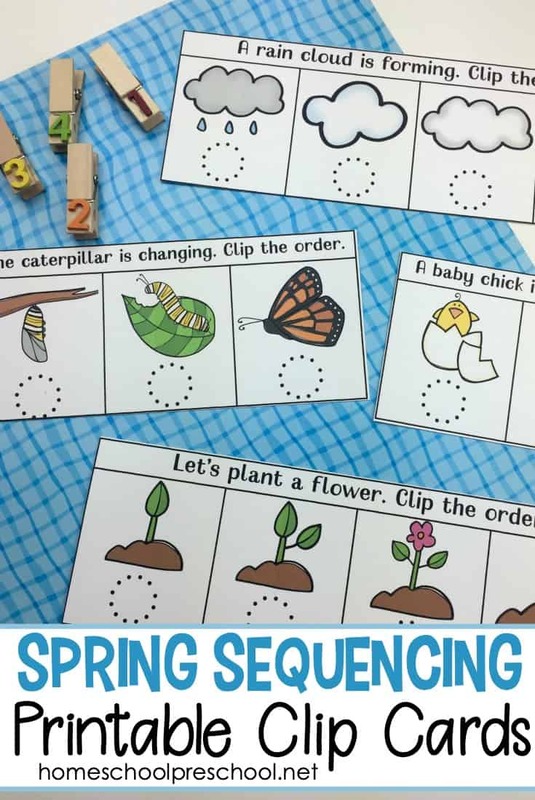 This Spring Sequencing Cards Printable is only available to my readers. Click the button below, enter your information, and download your printables. I love these! I’m sending this to my daughter because my grandchildren will enjoy this activity so much.